Each spring the bike riding season in DC begins with the Vasa ride. This is an event put on by the Washington Area Bicyclists Association and the House of Sweden, a.k.a. the Swedish Embassy. There is a family ride of 16-ish miles, the Halvasa of 31-ish miles, and the 61-mile Vasa ride, known in Malmo as the Whole Lutfisk. Okay, I ma y that up. That’s a relief. I think. At the start I talked with Michelle and Colin, WABA’s Jimmy Olsen, and with Michael from Friday Coffee Club. (Actually he’s one of three Michaels. Michael is the new Katie.) Michael was riding the short ride and I didn’t see anybody to ride with so I rode the 32-ish ride alone. I know the course by heart so there was no need for a cue sheet. 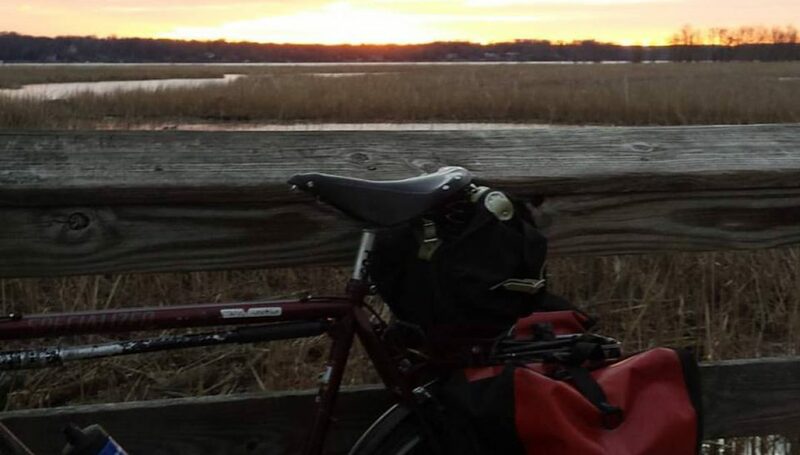 Ride out K Street to the Capital Crescent Trail. Cross over the canal at the boathouse. Ride up the steep hill to MacArthur Boulevard. Ride MacArthur Boulevard until it tops out (literally) at Great Falls Park, bang a right on Falls Road. Ride until you see the WABA pit stop at Potomac Village. Drink from Ursula’s stash of Gatorade in the back of the truck. Look around for people to talk with. Seeing no one you know, retrace your path one half mile. Hang a looie into Avenel. See the big houses. See the pretty golf course. Bang a right on Persimmon Tree Road. See more houses. See a different golf course. Bang a left on MacArthur. Repeat the first 10 miles in reverse. The route was a fitting place to try out the newly tweaked saddle height on the Cross Check. I think I am pretty close to dialing my set up in. My arms were a little sore but that could just be muscle atrophy from riding my recumbent so much. I did a 100 yard stretch on the canal towpath at the cross over point. Dang, if this bike isn’t awesome on gravel. Can’t wait to do the Whites Ferry century loop on this beast. At the end of the ride, I went into the embassy and had a cup of warm blueberry soup. It’s a thing. It tastes great after a cold ride. Did you know that the word “babe” is a direct translation from Swedish for Swedish Soup Lady? It’s true. I swear. I took a picture to prove it. Also, they said “Get well, Ricky!! !” because Ricky got clobbered by a car last week and they miss him. I didn’t see anybody I knew so I left after one cup. Outside I ran into Tom and Kirstin. She’s Ultrarunnergirl . She and Hubs were doing an ultrasugarthon in Georgetown instead of riding the Vasa. Greg, WABA Executive Director, appeared. He was all smiles after running a half marathon yesterday. You smile when the pain stops. It’s a running thing. And so, I headed home. After a totally unhealthy lunch, I turned on the Nats spring training game. You know that hour of sleep that I lost? I found it. And a couple more. Baseball cures the sleepy beast. Tack to WABA, the Swedish embassy folks, and to all the volunteers.